Summary: The West Beverly seniors are trying on their graduation gowns while Brandon and Andrea have an awkward conversation. It seems she’s been avoiding him since their time in the hotel room on prom night. Donna shows up at school and apologizes to David since Felice is blaming Mel for her drunkenness. David thinks it’s good news that the school board hasn’t handed down a suspension yet. Brenda says the same to the rest of their friends. Donna is summoned to Ms. Teasley’s office, where her parents are waiting. Felice is ticked but Donna’s father is more sympathetic. The superintendent is also present and reminds Donna of the announcement made the previous week about the consequences of any drunkenness at prom. Donna says she doesn’t know if she was drunk, since she doesn’t completely remember everything that happened. However, she admits to drinking, which gets her suspended and sent to a disciplinary hearing with the school board that night. Toby and Howard, the undergrad Blaze writers, complain that Andrea and Brandon won’t write about Donna’s situation. Toby taunts that they only publish fluff for the senior addition. 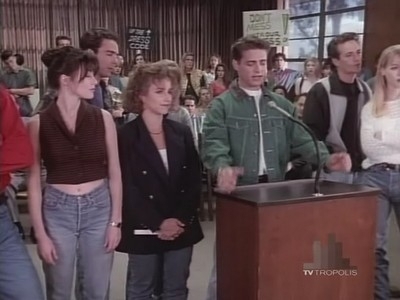 Donna’s situation is indicative of the entire class of 1993’s “dead spirit.” Jackie lectures Mel for serving the kids champagne and orders him to apologize to Donna’s parents. David and Kelly defend him, but Jackie has more important things on her mind: She’s sold the house, and they have ten days to move out. Dr. Martin wants to take a lawyer to Donna’s hearing, but Felice thinks it would be embarrassing. Donna feels bad that Felice is upset, but she doesn’t know what else to say. Plus, she’s the one who might not graduate. Felice still has no sympathy for her. The rest of the gang waits at the Peach Pit, where Donna calls to tell Brenda that she’s suspended for five days and can’t graduate. She can attend summer school and graduate in August, but she also has to attend a substance-abuse program. Her parents won’t appeal, and Felice thinks she deserves the punishment. Brenda shares the news with the others, who debate the pros and cons of admitting that they all drank, too. Most of them think there’s nothing they can do, but Brandon (of course) tries to get Andrea to agree that they should fight back. She declines. Dylan and Kelly head to his place for a study session/sleepover, discussing Dylan’s recent decision to try to get into Berkeley. Kelly isn’t completely on board since she doesn’t want to be apart from him. Mel apologizes to Jim and Cindy for serving the kids champagne, telling them Felice and Dr. Martin are next on the list. Brandon notes that no one has tried to prove that Donna was really drunk – she could have been sick. Jim replies that if the Martins aren’t going to appeal the decision, it doesn’t matter. Mel and David go to see the Martins, but Felice won’t let them in. David begs her to appeal the decision. Felice tells him that Donna broke the rules, so she has to face the consequences. Donna agrees with Mel, telling Felice she just wants to graduate with her friends. Felice claims that she’s already tried to use her influence with the school board. She doesn’t want Donna to humiliate her any more than she already has. Donna complains that Felice isn’t fighting back because she’s ashamed. She brings up Felice’s affair, saying it’s similar to her situation. Donna and her father forgave Felice, so why can’t she forgive Donna? The gang gets called to Ms. Teasley’s office, thinking Donna sold them out. Steve orders everyone to keep quiet. Dylan thinks the school board wants to use their statements to build a case against Donna. Ms. Teasley informs them that instead, the Martins have decided to appeal, and they want Donna’s friends to write letters on her behalf. They all feel bad for thinking Donna ratted them out. Dylan doesn’t think the letters will help, because he’s incapable of being optimistic about anything. Gil tells Brandon that he’s right about feeling like Donna’s being railroaded. When the Supreme Court hears a case, thousands of people gather in Washington to give their opinions. Maybe the West Beverly students should do the same. Brandon doesn’t think the students will march to support anything but a sale. Gil tells him they just need a leader, and once upon a time, he would have pegged Brandon to be that person. Brandon visits Jim at his office to ask for advice on leading a ’60s-style protest. He also wants to warn Jim in case he gets himself in trouble. Back at school, Brandon tells Andrea that finals are the key to the protest: If the seniors walk out of the exams, none can graduate, and the school board will have to listen to them. Andrea admits that it could work, but she’s worried about what she’ll be risking. If she doesn’t take her finals, she can’t be valedictorian. Brandon reminds her that she always wants to do something memorable. Steve is also anti-protest, thinking he’ll wind up getting expelled, since he’s still on probation. Brandon points out to him and the rest of the gang that Donna would do this for any of them. Dylan is on Steve’s side; Donna will still graduate, just not with them. Brandon argues that this is about making a statement and being heard. David’s willing to risk early graduation to help Donna. Andrea’s also on board, and Steve comes around. Dylan tries to talk Kelly out of the protest, apologizing for not putting his future at risk. She says she’s not the one who needs the apology. The kids spend the evening calling their classmates, all of whom are willing to support Donna. In the morning, Toby notes that Brandon wouldn’t support the possible dress code last week because it didn’t affect him, but now he’s organized a protest for a friend. She’s actually on his side and tells him that if he adds dropping the dress code to the seniors’ demands, they’ll get hundreds more to march with them. The other kids agree. Jim, Cindy, Mel, and Jackie all show up for Donna’s hearing. Jackie tells Felice that she would be against Donna if she thought her punishment would deter kids from drinking, but she knows that wouldn’t work. Felice says she just wants to see Donna graduate. At school, Gil notices everyone watching the clock, including Dylan. At the planned time, everyone gets up and walks out of the room. Gil’s pleased. Dylan stays back, but after a minute he decides to join the others. The students gather outside for their march, chanting, “Donna Martin graduates!” Meanwhile, the disciplinary hearing begins with Donna being given the opportunity to tell her side of the story. She admits that she’s scared, but both of her parents tell her things will be okay. Donna tells the board that she’s sorry she got drunk, but she was just celebrating with her friends. She didn’t think there was anything wrong with Mel’s champagne toast. She’s enjoyed high school and just wants to graduate with her friends. The march takes everyone to the building where the hearing is being held. The superintendent isn’t happy that the students are there instead of taking their finals. Andrea comes in to announce that they’re there to show support to Donna. She reads a statement from the juniors and seniors telling the board that they won’t take finals unless Donna can graduate. The superintendent thinks Andrea’s ridiculous. Felice goes outside and yells at the crowd that they’re not helping. Donna spent the morning apologizing, and the protest has probably undone all of that. “You all are the last thing I need here right now!” she tells Brandon. Brandon fails to respond that this isn’t about her. The superintendent threatens to call the police, but Ms. Teasley and a school-board member urge him to drop the case. The member asks if anyone bothered to consider the students’ reactions to the board’s recent decisions. The superintendent threatens to get the protestors’ college admissions revoked. Ms. Teasley delivers a message to Brandon, which he shares with the other protestors: If they don’t drop the march, they’ll all be flunked. Dylan responds on everyone’s behalf that they’ll all just go to summer school with Donna. Even Jim thinks things have gone too far. Brandon tells him he sounds like Spiro Agnew. The students take the protest into the hearing and make it clear that they won’t back down. Brandon makes a speech about how the school board made the alcohol rule because they thought they could enforce on someone who isn’t squeaky clean. Donna doesn’t deserve to be punished, so the students aren’t going to let that happen. Brandon adds that the juniors won’t be happy if the dress code isn’t dropped. A board member proposes that they drop the dress code and let Donna graduate as long as she attends a substance-abuse program. The vote is three to two in Donna’s favor. That evening, the gang celebrates at the Peach Pit and Donna gets her cap and gown. Thoughts: Wouldn’t the school rather let Donna graduate so they don’t have to deal with her anymore? I mean, either make an example of her or don’t, but you might as well let her go so the whole ordeal goes away. I guess Gil is supposed to be the cool, with-it teacher everyone likes. I just find him smarmy and annoying. Speaking of annoying, shut up, Felice. Shut up forever. The true villain in this episode is Steve Sanders. He steals the booze, and knowingly serves it to a minor who is later caught to be intoxicated by the school’s principal. Sanders is never held to account. In fact, the episode endorses the student’s misconduct. Jackie Taylor actually says, “If this (actions by the school board) would prevent just one child from drinking too much…Drinking too much!!!!!!!! Minors under 21 are not allowed to drink! Mel’s the one who provides booze to minors. Yeah, Steve steals it, but as a minor himself, he wouldn’t have been able to get it if Mel hadn’t bought it.